Of the many hundreds of commandments of the Torah, there are instances where the Spirit calls upon His people to perform something that is a distinct action which is visible and immediately sets the performer apart, marking them as His peculiar people among the earth. While the Spirit-minded person is called upon to set their bodies apart visibly with the performance of such commandments as tefillin (frontlets) and tzitziyot (tassels), the house of a believer is also to be marked with a visible claim that it belongs to the King of the world, the Redeemer of mankind. Scripture only commands us to have His Words written in those places. It does not explain in detail how it is to be done. There is thus a liberty extended to the individual believer on exactly how to carry out the desire of the Spirit in this instance, and variations exist among the different people groups who seek to obey this particular commandment. Traditional Judaism fulfills this commandment with a scroll upon which is written a passage from the Torah that is placed into a small container, which is then affixed to the doorpost of the house. Samaritans still perform the commandment in a much more literal fashion, engraving a passage into stone and placing it above or beside an entrance in their particular script of Samaritan Hebrew. affixed to the doorpost of the house. While it is worth repeating that there is no specific detail regarding how the commandment should be fulfilled, so long as it is done, there are significant details regarding how it was done in traditional Judaism and in Assyrian Christianity that merit further study. 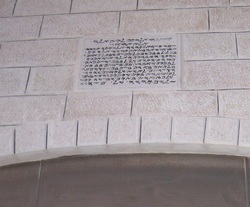 The typical method of fulfilling the commandment to write His Words on the doorpost is carried out in Judaism by having a sofer (scribe) write in Hebrew the words of Deuteronomy 6:4-9, as well as those from 11:13-21, which are then inserted into an aesthetic container, and attached to the doorpost. While there are various strict laws and rules that guide the observer desiring to perform the commandment according to traditional Judaism, there is one detail in particular that has fallen out of popular performance since after the time of Moshe ben Maimon, known more popularly as Maimonides, who wrote strongly against continuing the practice in the early 13th century. The practice in reference is to include on the scroll five Hebrew letters after the Biblical passages are completed. 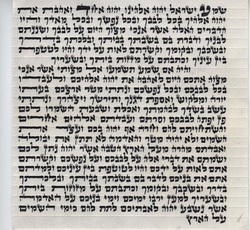 The accompanying mezuzah scroll shows an example of those letters. The letters form an acronym for the Hebrew phrase: “You shall live; truly life is firm.” This is scarcely to be found in modern mezuzah scrolls, having fallen out of use long ago. However, the fact that it was once employed in ancient scrolls is good reason to wonder why it was discontinued. The answer is extremely interesting. Ancient Jewish texts such as the Sefer Yereim (circa 1100) mention the use of it, but the reason for the disuse of the acronym is only finally hinted at in the Jewish work called Torah Sheleimah, wherein it is explained that the Hebrew phrase is a remnant of an ancient practice to remind the Jewish people of the final plague upon Egypt, and the bloody act which saved those who performed it from the destruction of that last plague. The Torah Sheleimah explains that the first letter of the acronym, the letter Tav, which begins the word TEKHIYAH (You shall live), is in reality the sign actually used by those obedient to the command to kill the lamb at the first Passover, when they smeared its blood upon their doorposts in the shape of that letter. While that is amazing in itself, as the Torah does not explicitly explain how the blood was to serve as a sign, just that it would be a sign, there is even more significance to this detail. The modern form of the letter Tav is much different than the ancient shape of the letter, and it is in that detail where the prohibition against continuing to write it and the implications thereof can be perceived. The ancient form of the letter Tav looks just like a slanted cross, or an X shaped object. Therefore, the sign placed upon the doorposts of the faithful believers in Egypt that protected their homes from the destruction of the final plague, according to the texts of Jewish tradition, was in the shape of a cross! It becomes immediately obvious with this realization why the medieval commentators whose authority was recognized in Judaism began to speak out against continuing the practice of including these letters upon a mezuzah scroll. All who included these letters were effectively making a cross, or at the least the remembrance of a cross made out of blood, upon their doorposts! To the Jewish minds who detested the horrific influence of medieval Christianity, such a prohibition would have made complete sense. Furthermore, while it cannot be known for certain exactly in what shape the blood smeared upon the doorposts in Egypt might have been applied, there is an interesting hint contained in the Torah itself that connects the Jewish tradition of it being a cross to just such a possibility. In Exodus 12:13 is found the explanation that the blood would be a sign. This merits attention because the term for “sign,” which is OTH in Hebrew, is here spelled in what is known in Hebrew grammar as Khaser spelling, that is, “defective” spelling. Normally, the word OTH “sign” is spelled with three letters – Aleph-Waw-Tav – not two, as the accompanying graphic illustrates. Now, what does this abnormal spelling tell us? Why would the Holy One give this special command concerning the application of the blood of the Passover lamb with a word not spelled correctly? When one reads a word that is misspelled in the midst of a sentence, it stands out, a glaring “sign” in and of itself to which the eye is irresistibly drawn. This is no different in the Hebrew language. Even more, if every single letter is important - if these are the Words of the Spirit to mankind - then every single nuance must be taken into account. So, again, what does this abnormal spelling tell us? The Messiah Yeshua calls Himself the “Alpha and Omega” four times in the book of Revelation (1:8, 11; 21:6; 22:13). The term “alpha” is the name for the first letter in the Greek alphabet, and in turn, “omega” is the name for the last letter in the Greek alphabet. This is important because the Greeks adopted most of their alphabet from the Semitic alphabet, where the first letter is Aleph, and the last letter is Tav. Thus, to the reader with a Semitic background who was reading the words of Messiah from Revelation, they would automatically understand the phrase “Alpha and Omega” to mean “Aleph and Tav.” It is additionally quite possible that the book was originally written in Hebrew or Aramaic, and those letters would have been blatantly used to convey the thought in those languages. All this connects back to the unique spelling of OTH “sign” in Exodus 12:13 because the term there in its Khaser (defective) spelling is simply Aleph-Tav, and not Aleph-Waw-Tav, as it should be, instead. The “sign” of the blood is thus a peculiar mark in the Hebrew text that points to the Messiah Yeshua, who died upon the cross, and that aligns so perfectly with the ancient Jewish tradition that the sign of the blood on the doorpost was originally in the shape of a Tav / cross. Furthermore, the blood was to serve as a sign “for you,” as the verse so explicitly states. The sign was for the obedient, Spirit-led people in Egypt; a foreshadow of the blood of the true Lamb of the Holy One who would bring redemption for His people on a Passover then yet to come. The purpose of His Word is to set us apart safely from the world, and to draw us ultimately to the Messiah who, upon the cross, shed His blood to deliver us from the slavery of sin.